A seamount is an underwater sea mountain formed by plate tectonics and volcanic activity. Seamounts form near the boundaries of tectonic plates and hotspots (Image 1). Plates force ocean and crust to descend towards Earth’s hot interior as they converge and collide near subduction zones. Here, the crust melts and forms into magma. The magma then returns to the surface as it buoyantly rises and fills in the gaps where plates diverge along mid-ocean ridges. Image 1. This image from the Scientific Library Online displays a range of mapped seamounts. Scientists have only explored a small percent of these seamounts. Earth’s crust is rich in silica. When it subsides, it makes the magma near subduction zones more viscous. Think of honey. Honey is extremely thick and sticky because it has a high silica content. The magma is also high in gases, including water vapor, and carbon and sulfur dioxide, that come from the ocean, soil, and rocks. Viscous substances don’t release gases quickly, so they accumulate in the magma chamber. As the gases increase, the pressure increases and magma explodes through the seafloor. The thick magma builds on the surface of the sea floor and cools rapidly, forming steep mounts. Isolated regions of magma called hotspots also create seamounts. Seamounts are known to be diverse ecosystems. Vital nutrients are brought in by strong ocean currents and the process of upwelling (Image 2). Upwelling occurs when the wind blows across the ocean’s surface and pushes water away, allowing water to emerge from beneath the surface to replace it, along with nutrients from the deep, cold depths. The pressure of the ocean creates friction along the seamount walls, forcing the nutrients to rise through an eddy (Image 3). Image 2. This image from NOAA demonstrates the process of upwelling. Image 3. 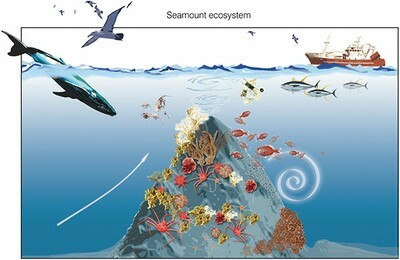 This image is a schematic drawing from Aliza Vinzant, illustrating a seamount ecosystem. The upward arrow on the left side represents the upwelling current, the whirlpool on the right side illustrates the eddy. Nutrients, such as nitrates and phosphates enable the growth of phytoplankton, which are microscopic algae that compose the basis of the marine food web and provide sustenance for a wide range of creatures. Seamounts home a variety of corals, sponges, anemones, mollusks, crustaceans, bivalves, echinoderms fishes, and many more organism. Furthermore, they provide resting and feeding areas for migratory species, such as sperm whales, sea turtles, seabirds, and sharks. Hence, we are exploring the hypothesis that humpback whales may be congregating around seamounts too. The biodiverse seamount ecosystems are unique because they contain endemic, fragile, long-lived, and rare species. However, this makes the ecosystems vulnerable. Commercial fishers are attracted to these locations because of the seafood abundance. As anthropogenic activity increases, scientists are recognizing the need to understand better the ecology of seamounts and factors that are impacting these sensitive benthic communities. In a study called, “The Structure and Distribution of Benthic Communities on a Shallow Seamount (Cobb Seamount, Northeast Pacific Ocean),” by Preez et al., they conclude that the majority of seamount communities are at risk from anthropogenic disturbances. They are also at risk from ocean acidification and are refugia for biota from marine climate change. As risk increases, conservation and management efforts also increase. However, efforts will be at a disadvantage if researchers do not collect enough baseline data. NOAA and other organizations are using unmanned underwater vehicles to conduct imagery surveys with the purpose of better understanding the ecology of benthic communities (Image 4). Image 4. This picture by NOAA depicts image mapping of a seamount. Europa is past the second seamount and is on her way to a chain of seamounts. At the second seamount, we received an audio snippet that sounded like an odontocete, or toothed whale. We’ve sent the audio to Dr. Jim Darling and Dr. John Ford (a killer whale specialists) for further analysis. Stay tuned for more updates and a post about the Shark Café in our next blog!